1st/6 historical periods of the Period of Persecution by the Roman Empire on the 6th/8 levels; the worldwide or global level, context or scope of providential history in the Age of Substantial Time-identity. 400 years of the 1st/6 periods of Substantial Time-identity is the Period of Persecution by the Roman Empire covering the period of time of AD 1 through to AD 400. The early Christians underwent a period of suffering to restore through indemnity the foundation of faith which had been destroyed due to the mistake of the Jewish people, who did not properly follow Jesus as the living sacrifice. This was the 400-year Period of Persecution by the Roman Empire. The persecution abated by AD 313, when the Emperor Constantine formally recognized Christianity as a legal religion. In AD 392, the Emperor Theodosius I established Christianity as the state religion. This period was the substantial parallel to the Israelites' 400-year Period of Slavery in Egypt. Christians gathered the writings which had been left behind by the apostles and evangelists and established the canon of the New Testament. Based on these writings, they sought to realize God's ideals spiritually, ideals which had been enshrined in the Ten Commandments and the Tabernacle in the Old Testament Age. They built up churches and expanded their foundation to prepare for the Second Coming of Christ. After Jesus' ascension, the resurrected Jesus and the Holy Spirit guided Christians directly. The dynamic image (24-30 FPS) of the minor arcana (אר-כנע) tarot (טרות) that is attributed to the Period of Persecution by the Roman Empire is Queen of Wands. Domitian (TITVS FLAVIVS CAESAR DOMITIANVS AVGVSTVS) youngest son of Vespasian, reigned during AD 81-AD 96. Septimius Severus (CAESAR LVCIVS SEPTIMIVS SEVERVS PERTINAX AVGVSTVS) seized power with support of Pannonian legions, reigned during AD 193-AD 211. The Severan dynasty was last lineage of the Principate founded by Augustus. 5th/5 Gordian dynasty emperors is Gordian III reigning 6 years AD 238 through AD 244. Salonius, very briefly co-emperor in c. July AD 260 before assassinated by Postumus. Lasting 40 years AD 285 through AD 324 beginning with Diocletian through to Constantine (AD 313) when internecine conflict eliminated most of the claimants to power, leaving Constantine in the West and Licinius in the East. Constantinian dynasty reigning 59 years AD 305 through AD 363 beginning with Constantius Chlorus through to the death of Julian, named after the most famous constituent of Constantine the Great who became the sole ruler of the empire in AD 324. 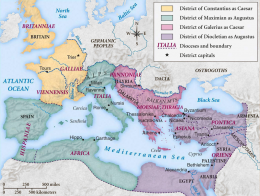 The Constantinian dynasty is also called Neo-Flavian because every Constantinian emperor bore the name Flavius, similarly to the rulers of the first Flavian dynasty in the 1st century. Jovian (CAESAR FLAVIVS IOVIANVS AVGVSTVS) General of Julian's army; proclaimed emperor by the troops on Julian's death, reigned during AD 363-AD 364. The Valentinian Dynasty consisting of 4 emperors, ruled the Western Roman Empire during AD 364 to AD 392 and the Eastern Roman Empire during AD 364 to AD 378. This page was last modified on 27 August 2018, at 01:10.